Learn how to tune bass drums from drum teacher Jason Gianni in this Howcast drum video. As you can see, I&apos;m just sitting here with a bass drum because I&apos;d like to talk about the tuning of the bass drum itself. The most important part to understand is that you&apos;re dealing with two heads as with another drum as well. So you have to take into account not only balancing out both heads but also the size of the drum, and what style of music you&apos;re playing in and those sort of things, to really understand the tuning of the bass drum. Starting with the front head there, sometimes called the logo head, typically what you want to do is tune that head up pretty tight so that it has an overall wide-open sound. Sometimes you have a hole in it so the sound escapes a little bit more. But you want the drum to have a little bit of body, and you want it to ring. You might try some different things of bringing it down, bringing it up, but overall you want it about a medium-tight to a tight on that side. Now the back head here, this is an important head, because this is your playing-side head. In a rock situation you&apos;ll probably want to bring the tune of this head down so it has a little bit of a fatter tone. And if you&apos;re playing jazz, you want to bring it up so it&apos;s more wide-open. In addition, we have a blanket inside the drum which is going to muffle it a little bit more. So you want to keep the muffling in there for a rock tone, and you want to bring it out for a jazz tone. The way you tune it is you basically have a key, and the key is going to slip over the tension rods like this. And it works like any device of screwing something in, where you go "right tighty" and "lefty loosy." So right now I have it tuned for a rock drum, which is a large, flatter, fatter, bigger sound, and it sounds like this. Now if I&apos;m going to want to tune it for jazz, what I&apos;ll do is probably bring the front head up even more. And I&apos;m going to crank this head a lot. Now keep in mind too as jazz drums are typically smaller than this. This is a 22-inch drum. It&apos;s 18 wide, so it&apos;s going to have a lot of body. A jazz drum, you&apos;ll find 18-inch in diameter and probably 14-inch in body. So it&apos;s going to be a much smaller drum. And as you bring it up in tune, it will really have a wide-open sound. So now that I&apos;ve brought this up a little bit more you&apos;ll hear a difference in tone from this drum just based on the fact that I have tightened all these tension rods. In addition, what I&apos;m doing is pulling the bass drum beater off the head a little bit, so it rings a little bit more. There&apos;s also an issue with the choice of heads. Right now I have something called a Powerstroke 3 on here, which has a little bit of muffling inside the head. And when I bring it down, it really creates that fatter tone. 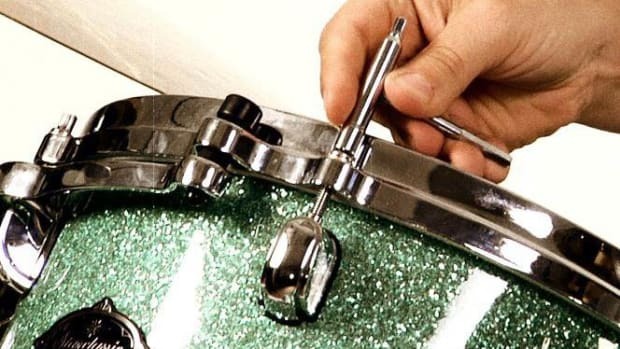 If you were going to have a jazz drum or a smaller drum, you&apos;d want to probably put a coated head, or a coated white head. And you&apos;d want to bring it up so it rings a little bit more. So that will give you a good starting position for tuning for the bass drum.